Hundreds of the group’s members came together for a peaceful demonstration in Tijuana on Sunday, calling for their asylum claims to be processed more quickly, Reuters reported. The demonstration reportedly got out of hand when hundreds of migrants broke away and headed toward the border. Mexico on Sunday said it will deport up to 500 migrants from Central America who sought to cross over, the Independent reported. They pushed past lines of Mexican police as they flooded across a river bed to the border fence, according to The New York Times. CBP did not immediately respond to The Hill’s requests for comment. Julio Ulloa, who is coming from Honduras, told Buzzfeed News that people in Tijuana are becoming “frustrated” as the U.S. processes only around 100 asylum claims per day. 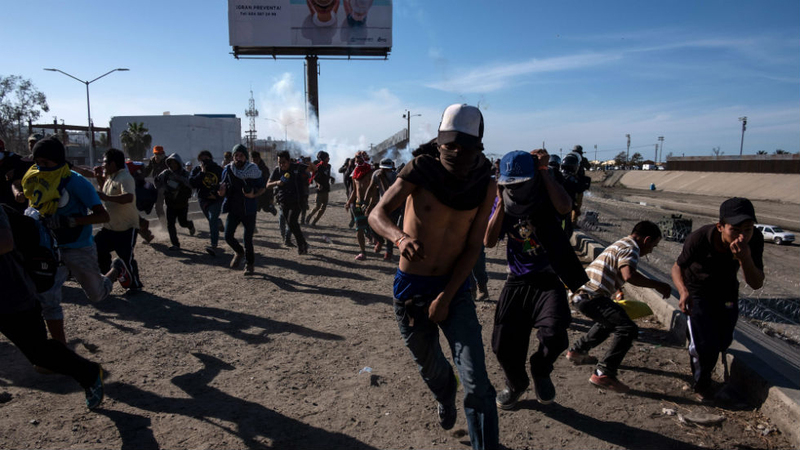 Residents of Tijuana have reacted to the caravan’s arrival with hostility, holding protests and calling for their deportation. Some have accused Trump of invoking the caravan in order to stoke anti-immigrant and xenophobic fears among his base. He focused in on it ahead of Election Day in particular, calling the midterms the “election of the caravan” in order to encourage GOP voters to hit the polls.